Hey friends! 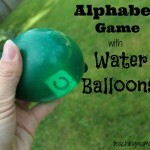 I have a neat activity to share today that will keep kids busy all summer long! 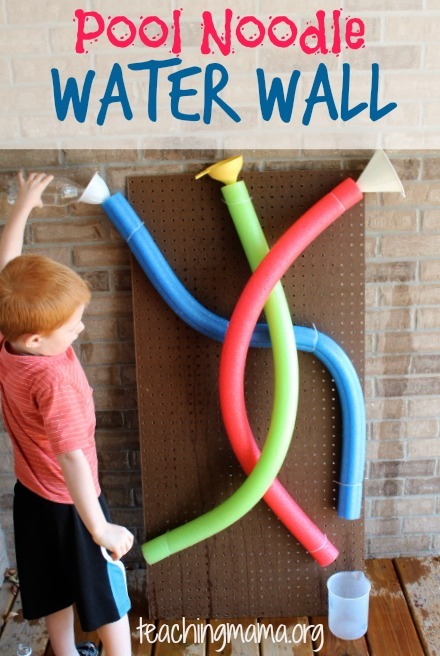 I call it our Pool Noodle Water Wall! 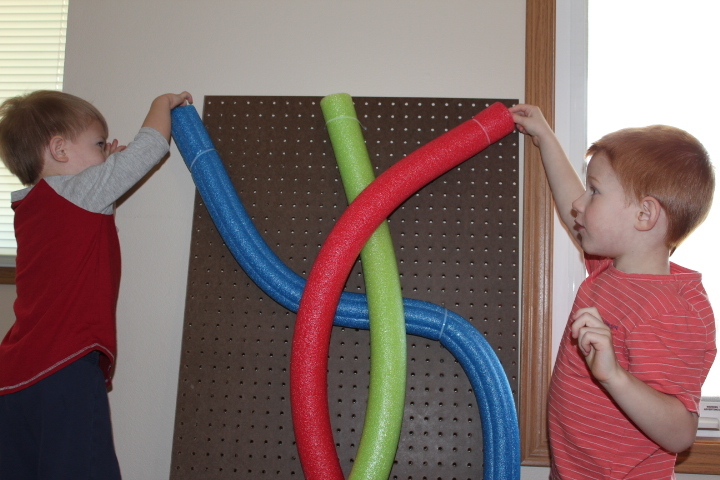 It is so much fun and I know your kids will absolutely love it! 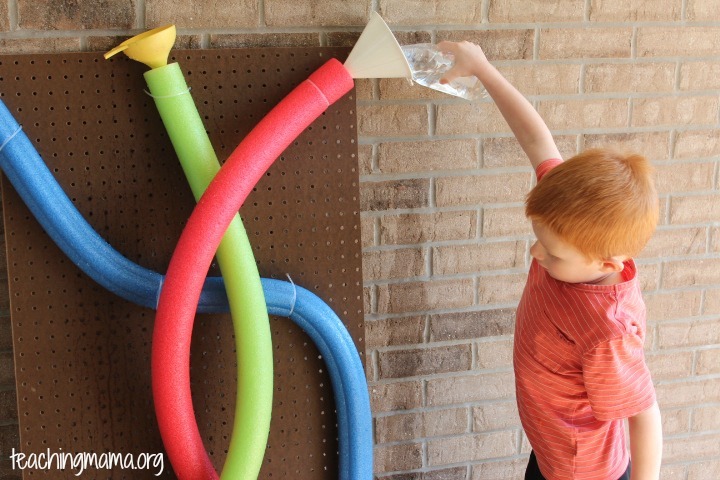 You can create your pool noodle water wall however you’d like! Feel free to follow the pattern we did or just make up your own. 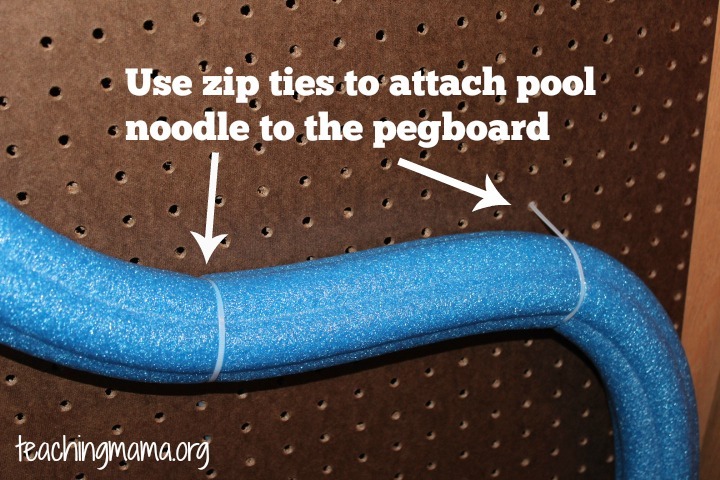 Once you’ve decided how you want the pool noodles to go on the pegboard, just use zip ties to attach the noodles to the board. 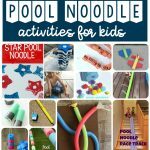 To make it easier to pour water into, you can add funnels to the top of each pool noodle. Then just take your water wall outside and start pouring in water! 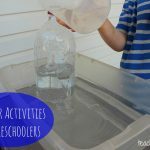 Your kids will love pouring in water and seeing it shoot out the bottom! Now how fun would this be on a hot summer day?! It’s a great way to cool off! 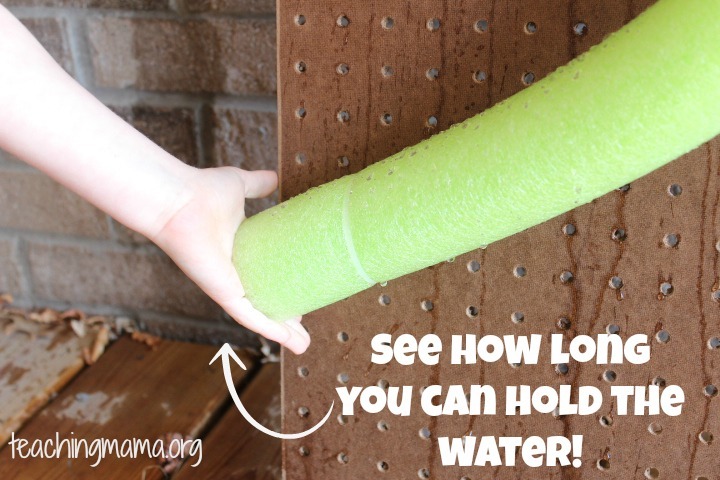 You can also try to hold your hand at the bottom of the pool noodle and then let go to see the water rush out! That would also be a great mini-lesson on water pressure. He watched them race over and over and over again. 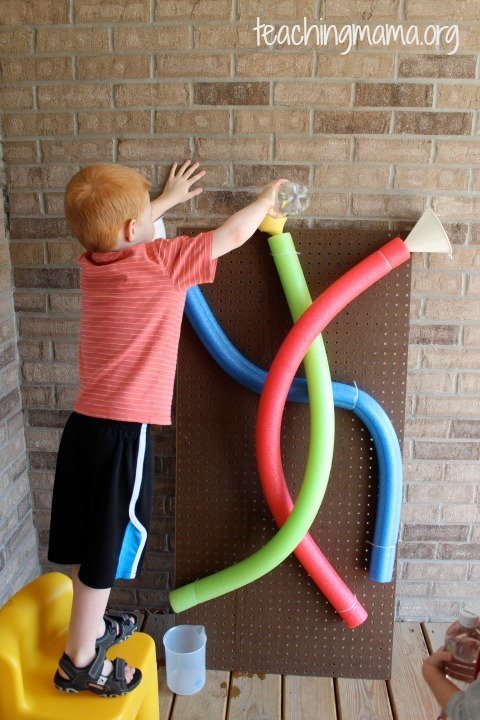 You could also have marble races with a sibling or friend to see which marble travels faster! 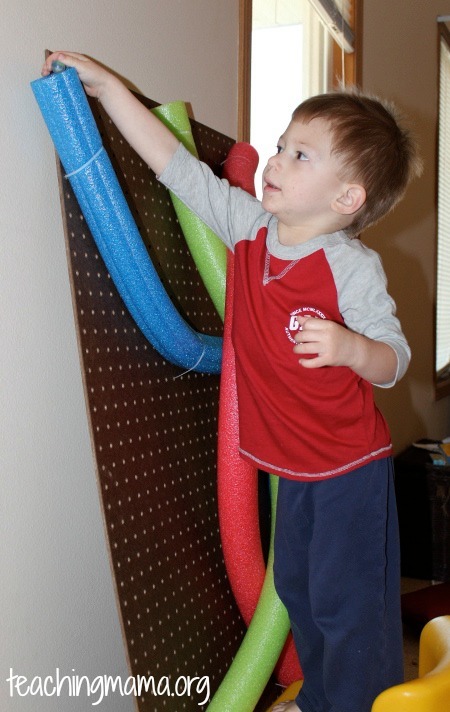 We just love our pool noodle board! It kind of reminds me of a glorified version of the pom pom drop activity! So, will you be trying this activity out? Please let me know if you do! LOVE this! Can’t wait for summer to try it out! Thanks for the tip about Lowe’s as well! I never would’ve known to look for that there! 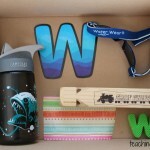 Dropping by from “We Made That” linky party! 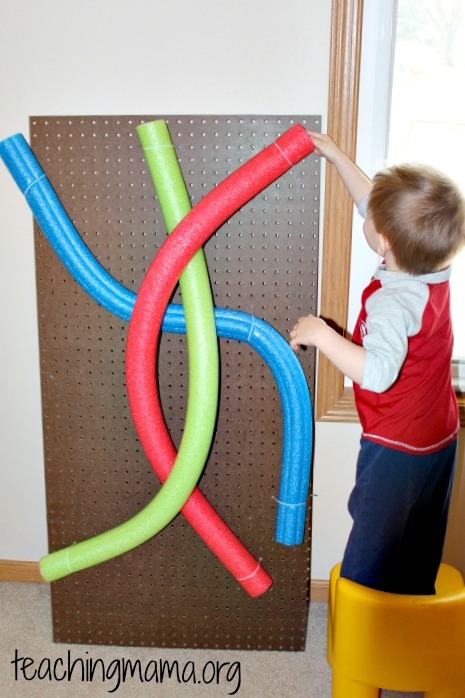 I was thinking the same thing, a chain link fence would work in place of the pegboard. 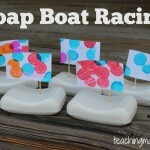 Such and easy and fun idea! 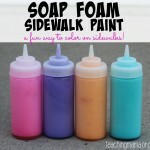 This will be awesome to try this summer! That looks like a blast! pinning! Tiffiny recently posted…Easter Board Books and Picture Books we Adore! Great idea. Can’t wait to make this for my 2 year old daughter this summer. Have a fabulous Mother’s Day! I think I will try this on our chain link fence! That is an awesome idea! If we had a fence, I would do that, too!! I LOVE this idea! I can’t wait to do this with our kids. I bet they could do something like this in the shower, too, on these cold days (they could play in the water 365 days a year!) – I’ll have to get my husband to think of a water-proof board that we can use. 🙂 Thanks!! What a fun idea. I am featuring this on my blog. Hello, Angela! We’ve tried this one too and it was very fun! Thank you so much for this guide and now my nephews and nieces have something to do other than computer games. Cheers!